Last week, the Union cabinet cleared the long-awaited purchase of 36 Rafale fighter jets from Dassault Aviation. With this Rs 58000 crore deal, the nearly two-decade-long Medium Multi-Role Combat Aircraft (MMRCA) saga finally comes to an end. All 36 planes will be delivered to India in a span of 66 months. Some have claimed that the Indian government managed to bring the price down significantly to about Rs 58,000 crore. But different figures have been provided by the defence minister. The original price for 126 aircraft was pegged at Rs 90,000 crore, he said in an interview to Doordarshan on April 13, 2015. He revised this figure to Rs 1.3 lakh crore in a subsequent interview to PTI. How this figure was escalated by the defence minister has not been explained. However, if the earlier figure of Rs 90,000 crore is correct then the 36 aircraft are nearly double the cost of the original deal to buy 126 of them. So is the latest Rafale deal really a bad one? Not really, considering that the UPA’s Rafale Deal and the latest deal are incomparable as far as the details are concerned, hence comparing the costs of the two without factoring in the differences is basically intellectual dishonesty. The original deal for the Rafale was indeed pegged at around Rs 90,000 crore during the UPA era sometime in 2012. But from there till now when the deal was actually finalised, many terms and conditions have changed. India has managed to squeeze in many add-ons into the new deal. 1. Dassault has agreed to make India-specific modifications to the planes, allowing the integration of Israeli helmet-mounted displays. The aircraft will be customised in line with the requirements of the IAF which include radar warning receiver, Doppler beam radar, infrared search and track among others. 2. The deal includes the supply of Meteor, an air to air missile, and Storm Shadow (also known as SCALP), an air-launched cruise missile with a range of over 560 km, with the Rafales. These additions mean the IAF can hit targets inside both Pakistan and Tibet while still staying within India’s own territorial boundary. 3. The deal is said to include a provision for a complete transfer of technology, including for the Thales RBE2-AA radar and software source code, spare parts and maintenance. The French have agreed to supply spares for a period of seven years at initial cost. 4. In addition, the French are also guaranteeing performance-based logistics support, which means that 75 per cent of the fleet will have to be airworthy at any given time. Till three years ago, only about 48 per cent of the Sukhoi fleet was able to fly at any given time, because of poor maintenance. 5. The deal provides for free training of 9 IAF personnel, including three pilots. The IAF will also get a guarantee for an additional 60 hours for the trainer version of Rafale fighters, and a concession to keep the weapons storage in France for an additional six months without any charge (in case the Indian infrastructure is not ready for storing the weapons). 6. The deal comes with a 50% offset clause which means that Indian companies, big and small, will get businesses worth over €3 billion. One main point of the offset was that 74% of it has to be imported from India. This means a lot of business and job opportunities in India, people familiar with the matter said. 8. In the original proposal, the first batch of 18 planes were to be manufactured in France, and the next 108 were to be manufactured in India. Later, as negotiations began, it was discovered that the cost would go up substantially (in fact to the tune of Rs 150 crore per plane) since the cost of labour man hours in India were 2.7 times higher than in France. In contrast, the new Rafale deal is for purchase of 36 aircraft in ready to fly condition meaning the planes would be made in France, eliminating the above price escalation. 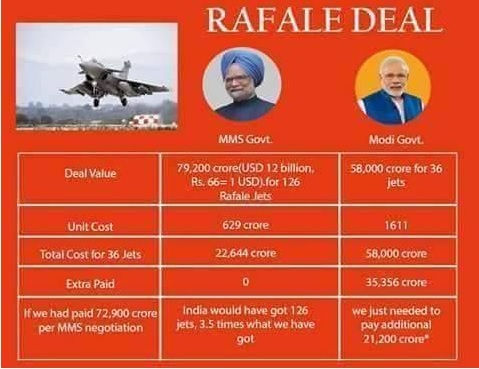 In the latest Rafale Deal which has been finalised, the “plain vanilla price” (of just the aircraft, excluding above add-ons) is about Rs 712 crores per aircraft as per the Economic Times and about Rs 687 crores as per PTI. So this defence “expert” Ajai Shukla has pegged 3 different prices per aircraft over the span of 2 blogs over 2 days. What caused this change of facts? In the second blog he claimed to have talked to MoD Officials. So are we to conclude, the assertions in the first blog were largely ill-informed “facts” which were not verified? 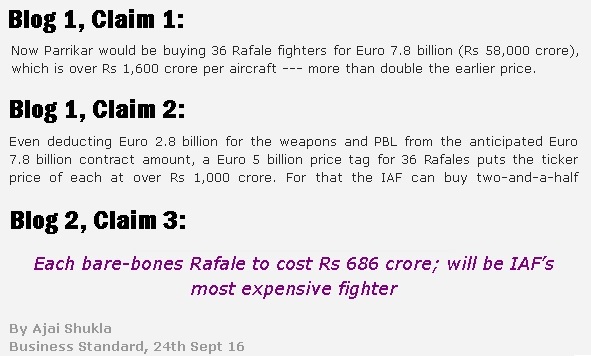 Saikat Datta too had made similar claims: “the 36 aircraft are nearly double the cost of the original deal to buy 126 of them”. While Ajai Shukla at least mentioned some of the add-ons which were obtained, which explained the change in cost, Saikat Datta was completely silent on all these aspects, even though they were in public domain. Being a journalist on the defence beat, one would expect him to surely know about these. In fact other journalists had a faint idea about the add-ons even back in May 2015. Certainly strange that Saikat Datta completely failed to mention them and in fact even claimed “How this figure was escalated by the defence minister has not been explained”. Irrespective of above ramblings by “experts” the point is this: The price of just the aircraft, has risen from about Rs 629 crores in 2012 to about Rs 685 crores in 2016 which is a paltry CAGR of 2.16%, and can be easily attributed to inflation and currency fluctuation. Only a fool would expect the price to be constant over 4 years. In totality, the Rafale deal seems to be a good proposition. Of course just 36 aircraft will not suffice and India will soon have to start negotiations for further procurement, but this indeed is a good deal to close. In the mean-time, it is advisable to take unverified opinions with a truckload of salt, especially after revelations of the existence of “Agusta Patrakars”, journalists who were on the payroll of defence companies during the Agusta-Westland scam.